It's been a crazy few days, it seems. And time is flying by. Wait, it's March already? Wow.... time really does fly when you are having fun! So.... back to the original reason for this post. We. Must. Start. Sending. Out. Letters. ASAP! Have you sent notification letters yet? Will you send all letters out at the same time? No. Just some -- both offer letters and denial letters. If I don't get an offer letter soon, does that mean I will get a denial letter later? If I don't get a denial letter soon, does that mean I will get an offer letter later? My friend received her letter, but I haven't received mine. Can I call you and find out when my letter will be sent out? No. 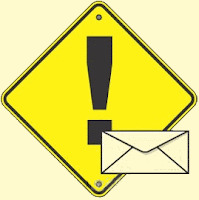 We are committed to sending all notification letters out by April 1st. If you haven't heard from us by April 5th, then definitely contact us! I heard you started sending out letters earlier last year. True? We may have sent them earlier -- by a few days -- but every year is different. As my mom would say "things are constantly changing in a constantly-changing world." Every year is different. Every admissions cycle is different. I attended the first interview day. Does that mean I'll be notified sooner? Oh, and my friend interviewed on the last day. Does that mean he will be notified closer to April 1st? Nope! At this point, everyone has interviewed. Our notification process doesn't take into account when someone interviewed. Can you fax or email my notification letter? No. We believe it's important to notify you with a letter in the mail. Are offer letters sent in big envelopes and denial letters sent in little envelopes? I have an offer from another school. Can you expedite my notification so I can make a decision now? Unfortunately, we won't. As we've previously told all our applicants, we are committed to sending out all notification letters by April 1st. To expedite a decision/notification wouldn't be fair to you, to us, and to all other applicants. Is patience a good quality in a future pharmacist?